This month Our Daily Bread Designs is releasing 5 Wedding/Anniversary Theme stamp sets and an Exclusive coordinating Die. You can see all of the July Releases here. Starting with this release, the ODBD Alumni Team will no longer be posting on Thursday, but will now be joining in on the New Release Posts to bring you even more inspiration for using Our Daily Bread Designs stamps! Continue reading below to find out how you can win a $50 Gift Certificate to the ODBD Store good towards the purchase of stamps. For my first card, I combined a sentiment from the new Wedding Blessings set, along with Our Daily Bread Designs Exclusive Quatrefoil Pattern Die and Antique Labels & Border Dies. The sentiment is stamped in Black Archival on White card stock, then cut with Spellbinders Petite Oval Dies, and layered on a Black panel that was die cut/embossed using the Antique Labels and Border Dies. The Quatrefoil Pattern Die was die cut from White card stock and layered onto a Black panel. To embellish, I added White Seam Binding that was tied in a double bow, along with Zva Creative Roses, and a die cut flourish using Cherry Lynn Designs Mini Fanciful Flourish. My next card uses Our Daily Bread Designs new Bird Cage and Banner Dies, along with the new To The Lovebirds and Banner Sentiments stamp sets. 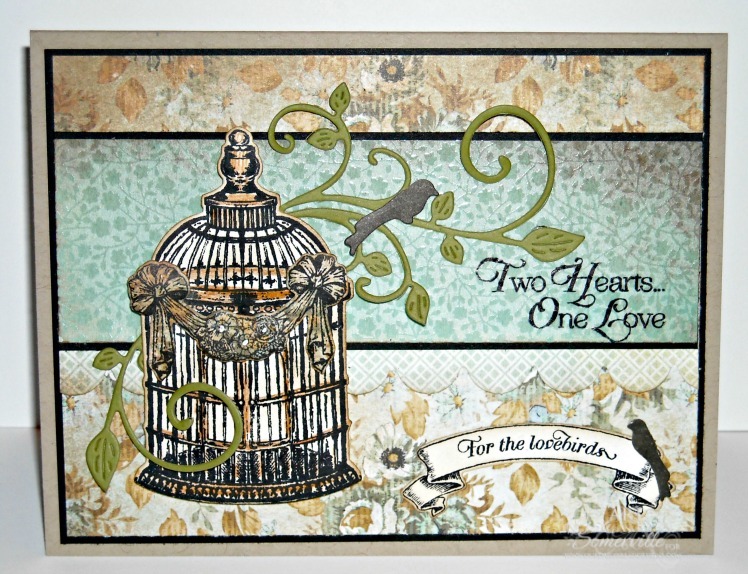 The bird cage, birds and banner were stamped on White card stock, then die cut using the new Bird Cage and Banner Dies. The Ribbon was stamped onto Kaiser Craft pattern paper, die cut and adhered to the bird cage with dimensionals. To add color to the Bird Cage, I used STAEDTLER Karat Aquarell Watercolor Pencils. The sentiment is stamped in Black on the pattern paper, "For the Lovebirds" is from the Banner Sentiments set, stamped in Black onto the die cut banner, sponged with Ranger Gathered Twigs Distress Ink, then adhered to the card. To embellish the bird cage, I added the Mini Fanciful Flourish die cut from Olive card stock, and a few of the die cut birds. Kelley will randomly be selecting 1 winner who will each receive a $50 gift certificate to Our Daily Bread Designs, good towards the purchase of stamps, just for commenting on the Design Team cards! You have until Wednesday, July 3, 2013 at 9:00 p.m. EST to leave your comments. Winners will be posted July 4th, on the Our Daily Bread Designs Blog, so be sure to check back there to see if you are one of the winners! The black and ecru really make that card pop. Both are beautiful. New stamps, new dies, big prize, wow! Love your wedding card!! The colors pop, just beautiful. Just a pretty birdcage, love the card! What gorgeous cards Lisa!! I just love your use of the quatrefoil background on the first and your designer paper and simple elegance on the second. both cards are so pretty and elegant. Such pretty cards. Very eye-catching. Both are beautiful, Lisa! 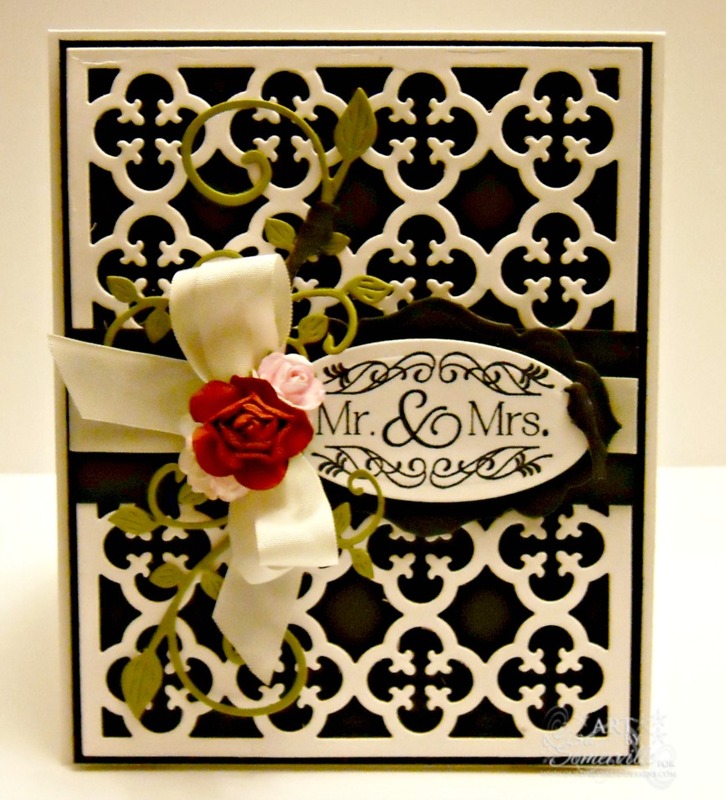 Love the quatrefoil on your first with the lovely rose/bow and the papers on the second are wonderful. Beautiful cards. love the layering and the colors. the stamps and details are super. thanks for sharing. Your cards are very nice!! beautiful samples, Lis! that first one is sooo classy!!! Beautiful elegant cards. Simple and classy. Lisa, your cards are beautiful. You really showcased the stamps so well. Love the Q die too. Your first card is wonderful, I love it! You have done a wonderful job. REALLY LIKE ALL THE COMBINATION OF DIES, COLOURS, EMBELLISHMENTS. LIKE THE USE OF THE Q DIE" LOOKS GREAT. THANKS SO MUCH. WOW, your QF die card is so elegant! I love it!! And the 2nd card has such cool, pretty papers!! So cool! Lisa, these are both gorgeous! What a fabulous new release, and the dies to match are perfection! I love how you've added the bitty birds among the other beautiful embellishments! Great new release! Hugs! So lovely! I admire the simple elegance of the first card and the softness of the second. Beautiful cards. The first one is so formal and classic design, great to have a card made like this on hand at all times. The second card would be great for an engagement card. I love this and this is one to CASe. Thanks for sharing. Lisa, Two beautiful cards! The first is very elegant! The pattern papers you combined on the second are amazing. The bow banner looks like it is made out of fabric! Thanks for sharing! Two very different styles, both beautiful. I love these cards. Your cards are beautiful! Love them! I like the elegance of the first card and the sweet birds and birdcage on the second. Oh I just love these Lisa!!!! The first one is so elegant! Perfection! And I am lovin' the second card with that ribbon banner across the birdcage! Love Love Love!!! Both are very nice but love the first - wow. 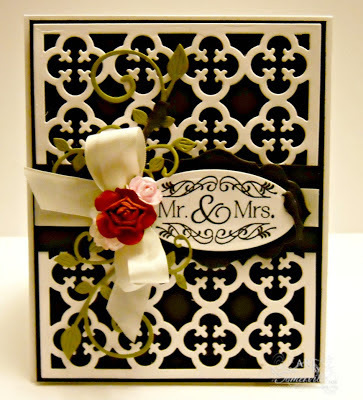 Wow Lisa - I love love love your first creation with the beautiful dies and classic black and ivory colors!! So gorgeous!! And your second is equally beautiful in the soft tones. I love your soft coloring on the birdcage - nice touch! WOW, Lisa...your first card is simply stunning! LOVE the cream and black design with the pop of red! Your second card with the beautiful papers is equally gorgeous! Very inspiring use of these new sets! Hugs! Your cards are absolutely gorgeous. The black and white one is stunning and the other one is equally neat in a different way. Both are great. Great work on both and especially on the cream and black. That is so elegant. Gorgeous creations! My wish list is growing! Love that birdcage sooooo much!!!! Both of these are gorgeous! Great job! Love the flourish on that stamp and a great background for it, I like how you used the banner on the cage too! Ooooo...ivory and black with a pop of red...elegance at its finest!! Gorgeous!! I love the sketch on the second too, as well as the papers and the sweet little bird and banner in the corner. It looks like it belongs in the designer paper design. Now these are wonderful cards. Love them both. Great color combos on them both. TFS. Gorgeous cards! I love the first one, especially. I think this has totally convinced me to get that Quatrefoil pattern die. It really does make a stunning layer! I love the elegance of black and white. Your card really shows off the die. Thank you for sharing. both are beautiful!!! I really like the black & white one!! Lisa, both of your cards are incredible!!! I love the elegance of the first and the gorgeous vintage colors of the 2nd.....fabulous designs for both! HUGS!! !